Lyft Inc. was sued by investors who claim the ride-sharing company overstated its market position when it went public last month, leading to a dramatic plunge in its stock price. Two separate class-action complaints against Lyft, as well as its officers and directors and underwriters, were filed Wednesday in state court in the company’s hometown, San Francisco. Since going public March 28, Lyft has declined 17 percent to $59.51. The investors claim Lyft was exaggerating in its prospectus when it said its U.S. market share was 39 percent. In both suits, the plaintiffs also dinged the company for failing to tell investors that it was about to recall more than a 1,000 of the bikes in its ride-share program. Click here to read the full article. A shareholder class action run by law firm Squire Patton Boggs against logistics software company GetSwift has been stopped in its tracks following a ruling by the High Court of Australia. Three class actions were initially filed by law firms Corrs Chambers Westgarth, Phi Finney McDonald and Squire Patton Boggs, alleging that GetSwift shareholders suffered financial loss because the company breached its continous disclosure obligations between February 24, 2017 and January, 19 2018. However, Federal Court judge Michael Lee ruled in May 2018 that Phi Finney McDonald would lead the charge and put the other two cases permanently put on hold. Click here to read the full article (subscription may be needed). Estonia’s state prosecutor is expanding an investigation into Danske Bank A/S to include Swedbank AB of Sweden. Meanwhile, the accounting firms Ernst & Young and KPMG were both reported to the police in Denmark amid allegations they failed to respond to red flags tied to possible money laundering. Since it was revealed last year, Danske’s $230 billion Estonian laundering saga has exploded to engulf multiple other firms. Swedbank is the latest bank to find itself the target of probes which investors fear will lead to hefty fines. Click here to read the full article. 4. Litigation Funding in the UK: a Further Nail in the Coffin of the ‘Arkin Cap’? The High Court has handed down a judgment that may have significant repercussions for the commercial litigation funding industry and defendants who face funded claims. Since 2005 commercial litigation funders have been insulated from a key negative consequence of funding an unsuccessful claim, namely having to pay the full amount of the successful party’s legal costs. This protection has become known as the ‘Arkin cap’. Click here to read the full article. National banking supervisors who control the European Union banking watchdog effectively forced it to clear financial regulators in Estonia and Denmark, who were investigated in relation to suspected money laundering activities by Danske Bank, a member of the European parliament said on Wednesday. Click here to read the full article. The shareholder litigation landscape outside the U.S. continues to rapidly grow and evolve. With nearly 50 cases filed or book-building during 2018, investors must now consider many more factors when deciding whether to get active and which recovery efforts to join. Here are three essential things you need to know when deciding whether to participate in recovery efforts outside of North America. Passive participation jurisdictions involve U.S.-style claim filing with investors submitting proof-of-claims forms or similar paperwork to court-appointed administrators or litigation organizers. This approach allows investors to recover losses without having to actively participate in litigation. Active participation jurisdictions require prospective claimants to affirmatively opt-in to recovery efforts and participate as a party. The associated party burdens vary and this approach requires an understanding of the risks and costs in each country. Most investors will try to streamline things by grouping the non-US jurisdictions by risk level – low, medium, and high – and then use loss thresholds to ensure they only get involved in riskier matters if their losses are significant. Each country has different securities laws, court rules, and ways of dealing with claims by multiple investors; but common factors necessary to understand the associated jurisdiction risks include Costs, Discovery and Anonymity. Costs – Who will pay the lawyers and court costs, and what is the risk of adverse party cost shifting (the requirement in most countries that the losing party must pay the other side’s legal costs, in whole or part)? Discovery – Investors must consider the burdens, including staff time and resources, associated with registering their claims, proving the elements of their claims, and responding to the other side’s requests for documents and testimony, either by discovery or request of court. Anonymity – If you join, how transparent will your involvement be to the other side and publicly? The legal landscape in each country is constantly evolving and staying on top of the changes is crucial to maximizing recovery opportunities. Outside of North America, filings in Australia and Taiwan dominate. 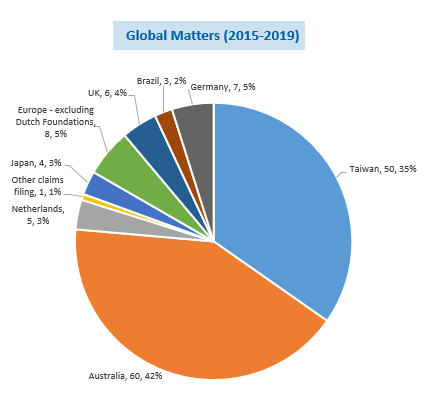 Excluding the U.S. and Canada, over the past three and a half years more than 75% of global filings have been in these two countries or a handful of others that similarly involve representative actions and/or passive participation. The process in Australia is similar to the U.S.; Taiwan uses class actions but to date we’ve seen limited eligibility and limited participation by FRT clients given the significant risks involved. For the remaining 25% of global filings – requiring opt-in, active participation – FRT’s jurisdiction risk profiles can help help simplify decision-making. Outside of the U.S., there are more companies getting sued, more funders entering the market, and increased competition for investor registrations. While each jurisdiction has its own nuances, contrary to popular belief, the majority of matters outside the U.S. involve representative suits or opt-out class actions, or jurisdiction risk profiles comparable to U.S. passive claim filing. An investor is likely to participate in any filing in a passive jurisdiction, as there is no downside. But in active, opt-in jurisdictions, which involve varying degrees of risk, most investors use “loss thresholds” that must be passed before participating. The changing investment landscape requires financial institutions to take a holistic view of their approach to global shareholder litigation. The changes are requiring investors to consider their exposure and upgrade their existing governance, controls, and protocols. Legacy systems and manual processes can’t keep pace with the rapidly evolving litigation landscape and aren’t able to handle today’s data and administrative requirements. An investor’s fiduciary duty is getting harder. Since 2010, when the U.S. Supreme Court ruled in Morrison vs National Australian Bank that securities traded outside the U.S. are not within U.S. jurisdiction, many international investors have effectively been barred from filing US class actions. As a result, many cases of fraud are being pushed overseas, with more lawsuits being filed in more countries, involving more lawyers and more diverse funding sources. Different laws impacting the investment community in different ways with different processes for recovery resulting in investor challenges to data/damages and claims submission. With the rise of antitrust settlements, investors need a new process for these recoveries driven by the complexity associated with damage calculations, data acquisition, and claims submission challenges. All cases start with registrations (book build) and as they proceed, courts often order registration before settlement negotiations or trial. Class members register with administering law firm, substantiating trades with account records. Courts and parties use registration to assess class size and losses – Australia has higher % recoveries than in the U.S. The litigation itself is handled by Japanese law firms and funded on a “no-win, no-fee” basis by the organizers. Prior cases have achieved successful outcomes. Proceedings are public, with participants listed on court pleadings, although Japanese legal proceedings are less transparent than in the U.S.
Taiwan (high risk) – download FRT’s Taiwan jurisdiction profile. Despite the volume of cases, we consider Taiwan a high-risk jurisdiction given the limited prospects for recovery, the formalities necessary to join, and the potential for costs to be taxed back. Financial Recovery Technologies will be releasing a monthly newsletter sharing the five most valuable articles about shareholder class actions. This is your exclusive summary of the latest industry developments related to settled, group and antitrust recovery opportunities – click here to subscribe.